STMicrolectronics stock sold off as the market soured on the outlook for the semiconductor industry. Shares of STMicroelectronics N.V. (NYSE:STM) stock dipped 11.5% in September, according to data provided by S&P Global Market Intelligence. The stock fell amid a broader sell-off for chip stocks. Micron Technology's CFO revealed at the Citi 2018 Global Technology Conference on Sept. 6 that pricing for NAND flash memory was still declining. Morgan Stanley published a research note the same day outlining a bearish forecast on the chip market, pointing to weakening pricing power and accumulating inventory as warning signs. These catalysts caused the market to take a more cautious outlook on the industry, prompting sell-offs for STMicroelectronics. 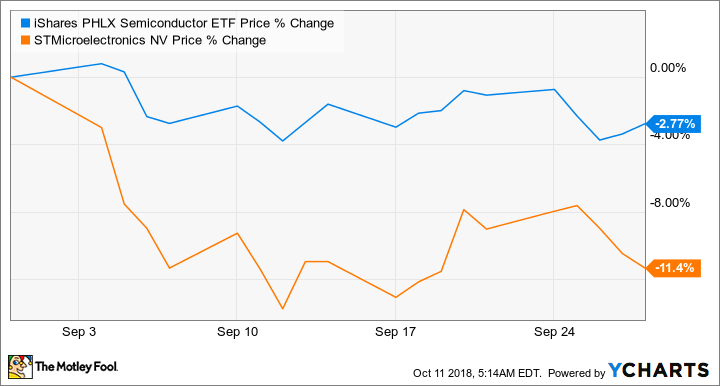 The iShares PHLX Semiconductor ETF, which bundles a wide variety of chip stocks together and is a good proxy for the industry's performance, fell 2.8% in the month. While pressure on the broader chip market could continue to negatively impact ST's stock performance, the business is unlikely to see dramatic fallout from declining prices for memory chips. The company makes chips for infrared camera and facial-recognition technology used in the iPhone X line and might also be providing near-field-communication chips for Apple handsets and wearables. Smartphone stagnation could be a negative catalyst, but ST's position in rising categories like automotive chips, connected-home products, and other Internet of Things technologies gives it other avenues to growth. 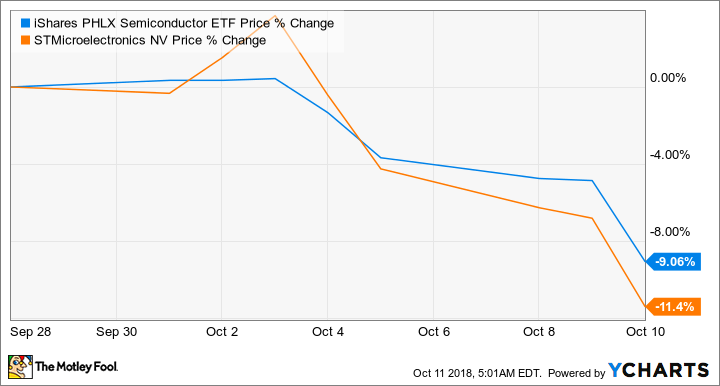 ST shares have fallen another 11.4% in October as of this writing, with ongoing pressure on semiconductor stocks and a more-recent broader market sell-off contributing to the decline. The company is scheduled to report its third-quarter earnings results after market close on Oct. 24 and is guiding for sales of roughly $2.5 billion for the period, up 10% sequentially and 16.8% year over year.